Let me give you another update on my Virtual Business Matters Venture: The Filipino Virtual Assistant Business Tutorials and Tips Philippines. This month VBM turned one year already. Despite busy days and projects, the owner was still able to write some mini tips and simple tutorials regarding what is happening on the internet and other Internet marketing technologies plus other trending stuff related or not even related to virtual business and internet marketing matters. If you’ve been following this site for a year now, thank you so much. To all VBM RSS subscribers, thanks indeed for trusting. This update is related to my update last year. You can check my previous post here: Filipino Virtual Assistant Business Philippines 2011 Report. This time, VBM is going to show you some statistics again during the span of one year. Just three updates. 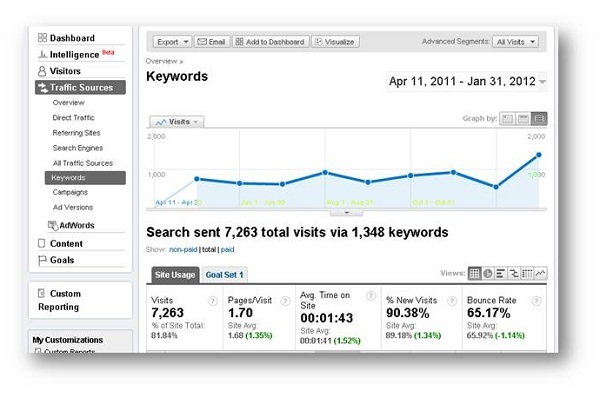 Let us get the advantage of using these free tools like Google Analytics, Google Feedburner and Blogger Stats tools. I love seeing uptrend. 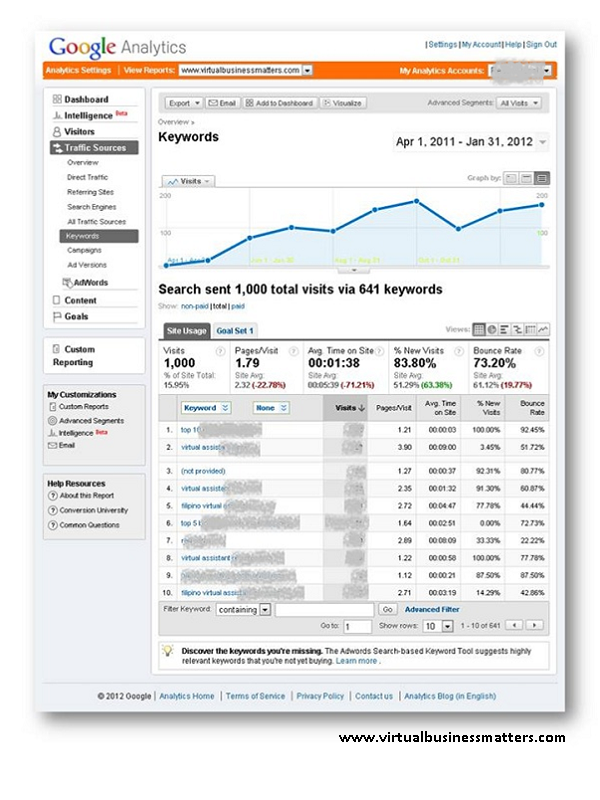 The image below is from this free tool called Google Analytics. Though I hide some details on my snap shot, the important thing I wanna share is that, you can create a site, publish it, use some SEO strategies and there you go, your sites or blogs can be seen via search engines using related niche keywords. Last time, I was so happy that I reached 65 Total Visits via 53 Keywords (as of May 31). Now, the last time I checked VBM Google Analytics, it says that VBM site had reached over 1000 total visits via 641 keywords. Imagine that, from 65 it became 1000. From 53 keywords to 641. My highest record so far based on my other project is 7,263 total visits via 1,348 keywords. See captured image below. This is from another niche. Frankly, I don't want to include this here. I know this is very small number compare to popular internet marketer. But again, I want to thank all VBM subscribers for giving yourself a nice try and for trusting VBM. It doubled since my last update, from 94, now times two. Time will come, we will get there. Last tool I wanna share is the update inside Blogger Stats. Nothing to brag about this, but based on my last update, the number doubled since July 1, 2011. From 19,094 to 41,184 views. That's it. Again, thanks for visiting this site. This year, I decided to make some twist. This year, I will post not just internet marketing and virtual assistant matters. I would like to share other stuff like Philippines Stocks Update (once in a while, whether you like it or not), some training events like Bo Sanchez Events, Francis Kong Events, Jomar Hilario’s Events. It could also be live events or online seminar or webinars. Again, if you want to receive a free updates via email, you can also subscribe on my RSS Feedburner located on the right side bar of this blog. After you enter your email, please don't forget to check your email for confirmation. Just check your email after you subscribe, ok? Thanks and keep coming back. This blog is really very informative. I think very few people know how a Virtual assistant can help their business. Virtual assistant utilize latest technologies to deliver their services and to communicate with clients and they can handle wide variety of support services through a single point of contact. Virtual assistant can make one's life easier and better! @John: Thanks for dropping a line about the advantage of having a virtual assistant for business but I am not in favor of U.S. President Barack Obama's support for a US bill against business process outsourcing (BPO) and virtual assistant services particularly here in the Philippines. Awesome!! thanks for sharing this information. Here Online chat services many of them upload their first year business result through the help of virtual assistant. I wish to say that this post is awesome, nice written and come with approximately all vital infos. I would like to see more posts like this .